Lifetime Gutters is a fully licensed and insured certified roofing contractor. We’ve installed hundreds of roofs in Decorah and across northeast Iowa and the entire Driftless region. Our installation of shingles and underlayment is second to none, because we take the time to do things right. 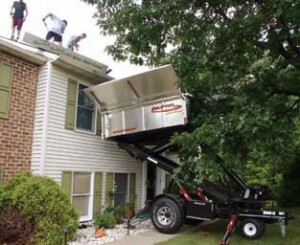 We save your landscaping with the Roofers Buggy. You put a lot of time and money into making your landscaping look good, so why ruin it? That is why Lifetime Gutters is proud to offer an Equipter Roofing Buggy as a part of our roofing service. This piece of equipment does an excellent job when it comes to saving your landscaping. The bed of the Roofing Buggy elevates to the height of your roof so that we can shovel all the waste directly into it, without anything ever touching the ground. In 2009 we were proud to introduce Malarkey shingles to Decorah and Northeast Iowa. Our research found Malarkey to be a company that produces an exceptional product and offers one of the best warranties in the business. There are several benefits in using Malarkey roofing products. Not only are their roofing products attractive, but they also withstand the test of time. All of their shingles are designed with The Zone, a patented technology that allows for better fastener placement so that your shingles are installed properly the first time around. Unlike standard laminate shingles, The Zone prevents water from troughing sideways and even has two rubber modified rain seals to keep water from blowing up behind the shim. Malarkey is also known for their outstanding customer service. You can rest easy knowing that if something ever does go wrong, you are in good hands. To boot, Malarkey also offers Energy Star rated roofing materials. We'd love to answer them! For inquiries on our products or services, please contact us.